The other day I shared with you about porridge pancakes using leftover oatmeal. 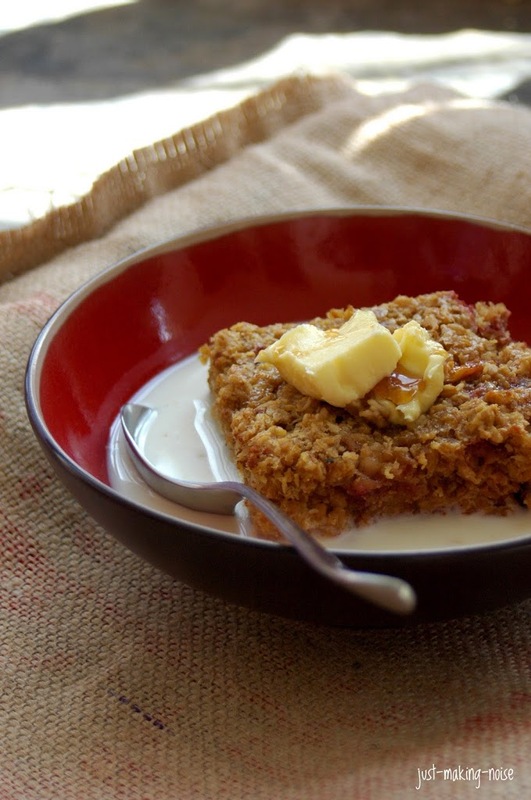 Today I am sharing one of my family’s favorite breakfasts… Oatmeal Bake. Really, you can’t go wrong with oatmeal bake. So satisfying, nourishing, delicious & simple. Do I need to say more? For those of you who are in the cold winter months right now… this will bring a little bit of sunshine and tropical warmth right into your kitchen! My favorite way of enjoying a hot piece is surrounding it with a deep moat of fresh milk, 2 thick slices of butter and a heavy drizzle of raw honey or real maple syrup. Sometimes I throw some fresh fruit on top, if I didn’t use it all for the bake! What I love about oatmeal bake is I can use whatever fresh & dried fruits, spices and nuts I have sitting in my kitchen. Since making my first oatmeal bake (inspired by Wardee’s recipe), I’ve made at least 10 different varieties of oatmeal bake. Combine oats, choice of acid and water in a big bowl. Cover and let it soak overnight (if using sourdough) or up to 24 hours (using whey, vinegar or lemon juice). NOTE: I usually use sourdough starter to soak my oatmeal overnight. I learned from my friend, Wardeh, at GNOWGFLINS that sourdough starter improves the effectiveness of soaking by adding phytase to reduce phytic acid and organisms to accomplish an overnight soaking effectively. Don’t worry, it won’t be sour as long as you drain and lightly rinse the oats in the morning! Morning arrives: preheat the oven to 375 F. Grease a 9×13 baking dish. Drain the oats through a fine sieve. Gently rinse and allow to drain while mixing together other ingredients. In a large mixing bowl, mix together butter, milk, eggs, sweetener, vanilla, almond, nutmeg and sea salt. Add in strawberries, pineapple, coconut flakes and oats. Mix it all together gently, yet well. Pour oatmeal mixture into a greased 9×13 baking dish. Smooth out the top. Bake for 45 minutes to 1 hour. It should be golden brown when done. Insert a knife or toothpick, it should come out clean when the bake is done. Take bake out of the oven and set it on a cooking rack. Let it cool for about 15 – 30 to set before cutting into bars. Enjoy it simply topped with butter and raw honey… or do it my way (read above)… Store leftovers in the fridge, but you can leave it out for a day. Excellent snacks for around the house, park, traveling via airplane or car!! 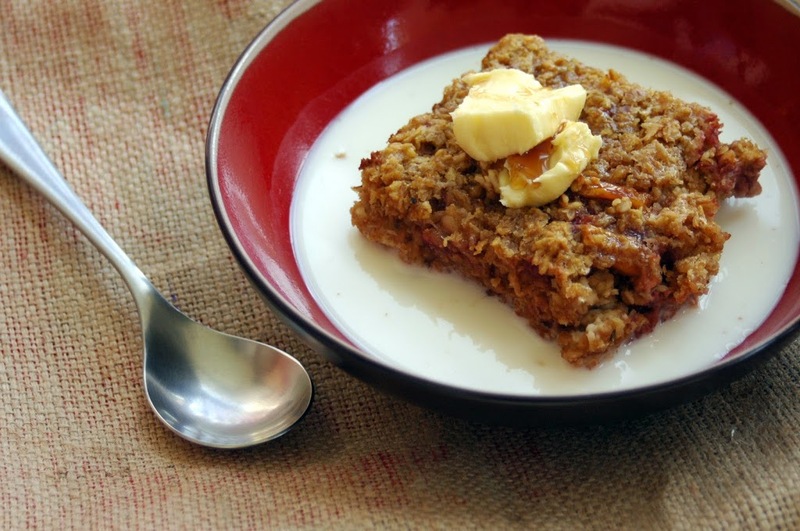 What are you favorite ingredients for a good, nourishing Oatmeal Bake?? « Got Extra Porridge? Make Porridge Pancakes! This really does look so very delicious. It’s like making porridge special and fun without a ton of work. This oatmeal sounds very tasty.. The photo is definitely calling my name. Yum Yum. I made this with crushed pineapple this morning -it was DELICIOUS! Thanks for a great start to a great recipe, I want to wean my 5 children from the somewhat healthier low sugar whole grain w/flax seed instant oatmeal…. So I went with a chocolate bake. I used a little less sugar, chocolate almond milk, some powdered protein and chocolate chips. Delish! If you substitute sourdough starter, how much are you using? And do you also add water? Thank you! !